19-year-old Tomas Hertl scored the first two NHL goals of his career Saturday night, and it's just as we feared: he became instantly addicted to scoring NHL goals. He has six of them now. He's on a bender. 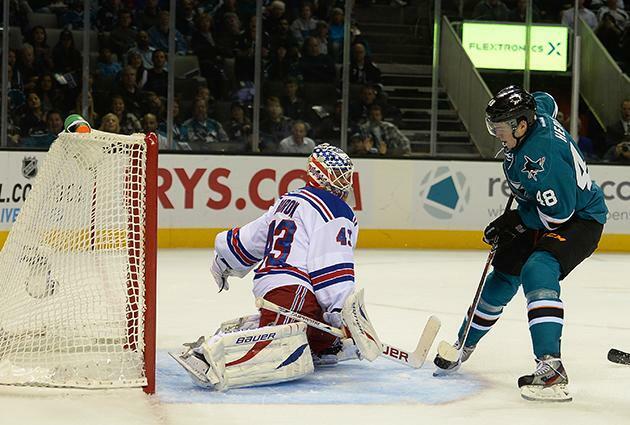 On Tuesday night, Hertl returned to the ice and went off, scoring four goals in the Sharks' absolute shellacking of the New York Rangers. He only got better as the game wore on, too. His final tally of the night was indisputably the best score of the young season: in alone, with his Mom watching in the stands no less, Hertl went between his legs before roofing the puck on Martin Biron. That's probably what it would take to make my mom shed tears of pride for me too. I'm not bitter or anything. It takes some incredible presence of mind to make a play like that ever, let alone in your third NHL game. And that, my friends, is why they call him teenage mutant ninja Hertl. Hertl's fourth goal of the night made him the fourth-youngest player in NHL history to record a four-goal game, and the first teenager to do so since Jimmy Carson did it for the Kings on March 30, 1988. But perhaps the most amazing thing about Hertl's four goal night is this: he was only on the ice for eleven minutes. It took me longer to write this post.